There are a few varieties of Fried Rice across Asia; Thai fried rice starts goes in a much different direction than most. 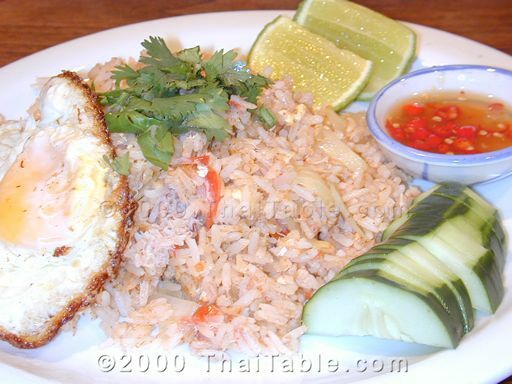 In Thailand, Fried Rice is a good lunch dish, served with cucumber and a wedge of lime. 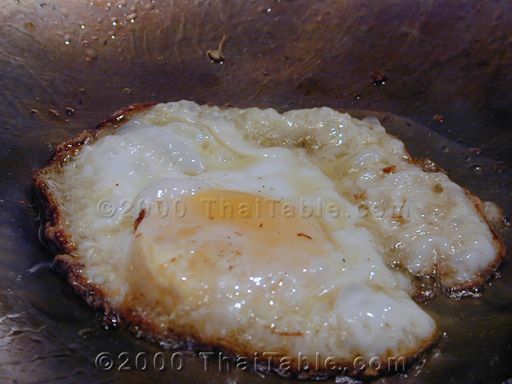 Often, the Thais like their fried rice with fried egg. If you like fried rice with fried egg asked for 'kao pad kai dow'. The most popular fried rice is crab fried rice. But for me, fried rice is a good way to clean the refrigerator since most any vegetables and meats you have in your fridge will do. For meats, I use everything - bacon, canned crab, ham, tofu hot dogs - your name it. Any vegetables will do too. Have fun! 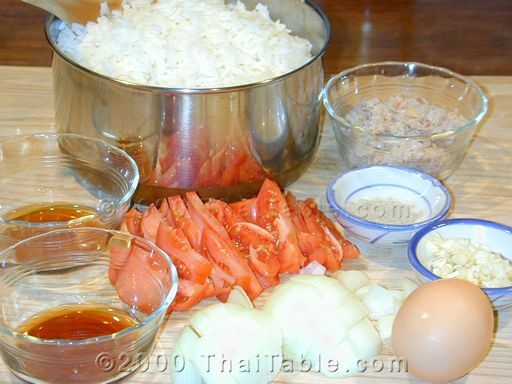 Thai fried rice gets much of its unique flavor from the mix of fish sauce, soy sauce, chili peppers and lime. The cilantro and a dusting of pre-ground white pepper gives the flavors a clean, rounded finish. A wok - a wok is the best tool for fried rice. If you don't, it can be tricky but still manageable. However, if you are cooking for one, it's not a big deal. It's harder to move volume in a pan. High heat - you want your pan/wok as hot as possible. That's why it frequently tastes so much better at a restaurant. It seems like there are a lot of stirring and flipping. 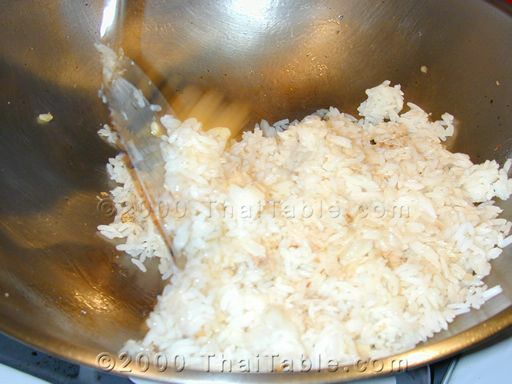 Only stir as much as necessary and be gentle with the rice. 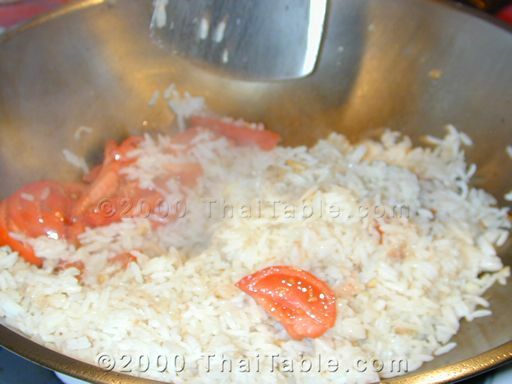 Too many stirs may break the rice and turn it into mushy fried rice. Dry rice - Cook your rice with 10-15% less water. You'll be surprised how much flavor the white ground pepper and lime can bring to fried rice. If I'm having fried rice with fried egg, I start off with frying the egg first. That way, I don't have to clean the wok before working with fried rice. Fried Egg: This type of fried egg has crispy egg white. Add a good amount of oil into the wok. When the oil is hot, crack and drop the egg into it. 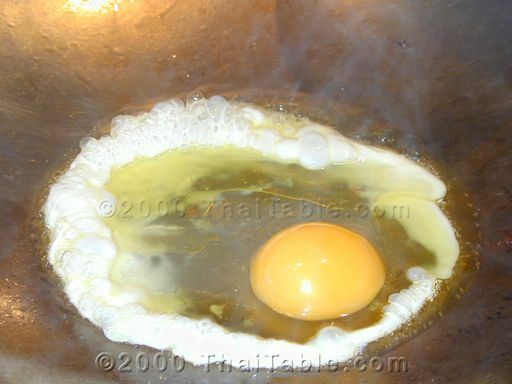 Tilt the wok to one side and splash the hot oil onto the egg. When the bottom is brown, flip the egg over. When the egg is all golden brown, remove and set aside. Fried Rice: Heat is the key ingredient in making a great fried rice. Remember you are up against the restaurants' super hot gas stove. Heat up your wok until it's pretty hot. You'll need to work quickly with the hot wok. Have all your ingredients ready. 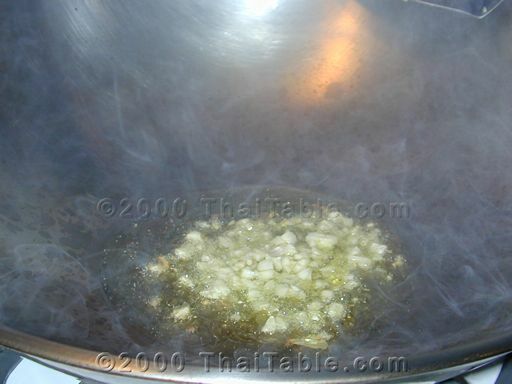 When the wok is extremely hot (smoking hot), pour in the oil and garlic. Stir quickly. Add any uncooked meat. (If you have cooked meat, add after the rice.) If you see that there is juice coming out from your meat and pooling on the bottom and not evaporating, your wok is not hot enough. Turn up the heat or cook the meat longer until there is no juice coming out. If your rice is cold, heat up the rice in microwave. Cold rice will cool down the wok. Fluff the rice into individual grains. Add the rice and stir to mix. 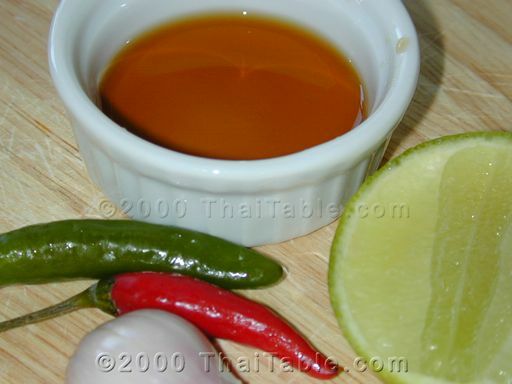 Sprinkle the fish sauce and soy sauce and stir to mix again. Now the rice is coated with flavors. Add all the vegetables, except for green onion. Stir. Push the rice aside and make room for the egg. Add the egg and scramble the egg until the egg is all cooked. Add the green onion and sprinkle white pepper and stir. Turn off the heat. Set the rice on a serving plate. Sprinkle ground pepper and cilantro on top of the fried rice. 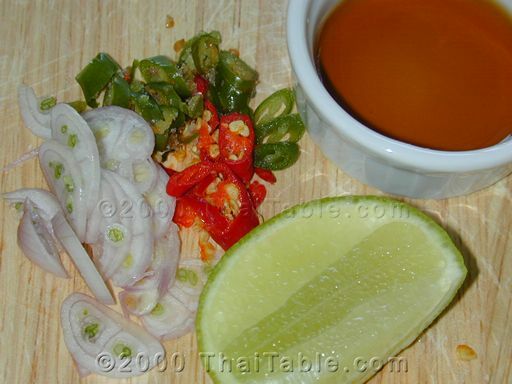 Serve hot with a wedge of lime, sliced cucumber, whole green onion and chili fish sauce. When in Thailand in a Thai restaurant, you may see green onions in a jar on the table. They are for fried rice and a few other dishes.